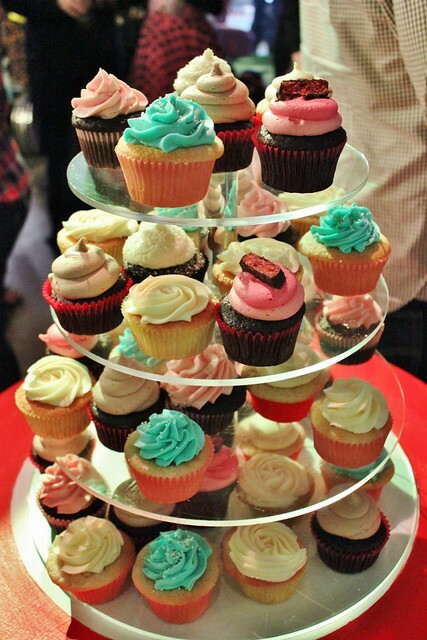 Last week I was treated to an awesome night of cupcakes, slushies and entertainment. 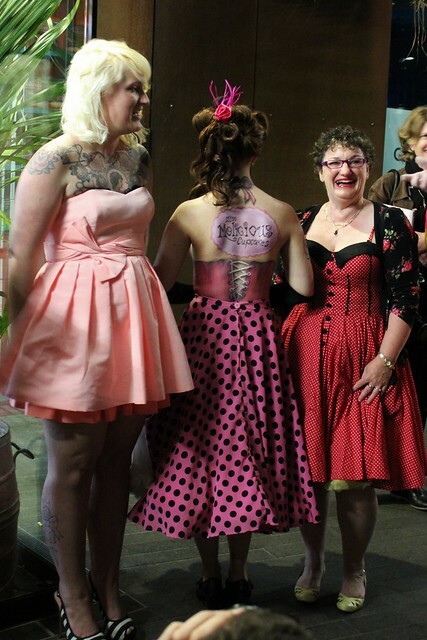 With a red carpet, burlesque dancers and balloon artists this book launch could only be for something as quirky and and fun loving as the Miss Melicious Cupcakes cookbook. 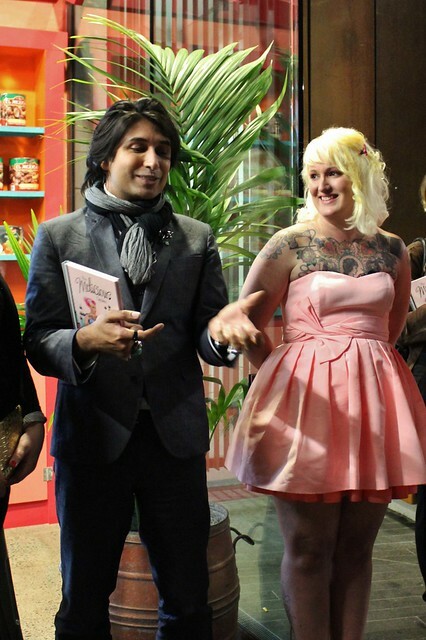 As I've mentioned in my review of Miss Melicious cupcakes, Mr S and Missy go way back, small world huh?! Well I've kept in contact with Missy as she's being venturing into this new realm of writing a cookbook and now the day has finally come when it has hit the print. I think I almost got a bit teary eyed when the speeches were happening, everyone said how proud they were of Missy, I'm proud too! 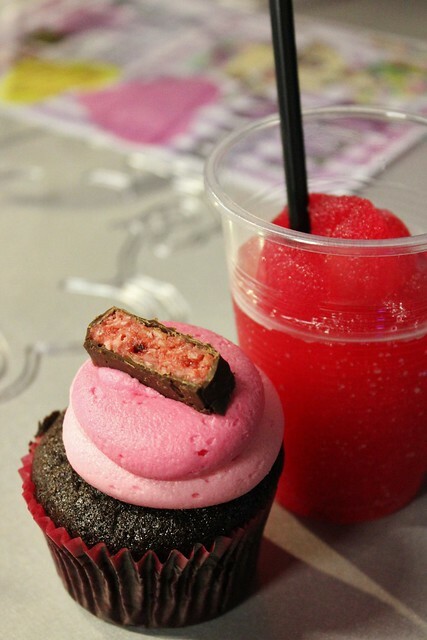 My fave cupcake flavour Cherry Ripe with a raspberry slushy! Yum! There were some special guests present too, including Colin Mathura-Jeffree who was totally sweet and couldn't have spoken any nicer about Missy and her cupcakes. 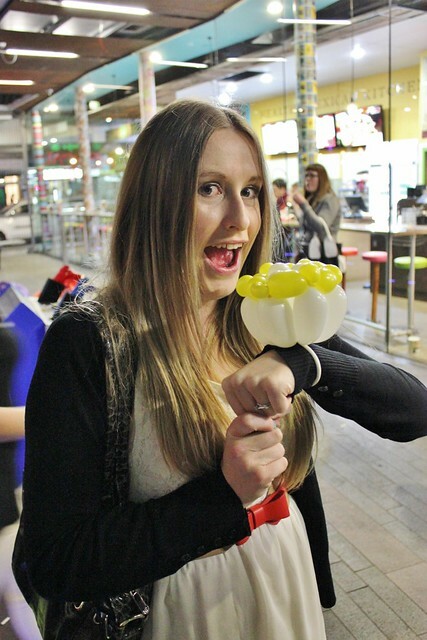 Along with all the exciting entertainment was a very talented balloon artist who made me my very own cupcake bracelet! Too cute! As if dancers, balloons and great food weren't enough there was also a model painted Miss Melicious style walking around see if you can her, it was so well done it's hard to tell where the paint stops and skirt starts! Guess whose dress is painted on? Mr S and I enjoyed the night as we drank slushies, downed cupcakes and flicked through THE cookbook to get a first look. I was overwhelmed by the amount of recipes Missy has managed to fit in her cute little book, over 40 recipes! With flavours like Pina Colada, French Toast, Creme Brulee and Bubblegum I actually cannot wait to get baking and try out all these crazy flavours, keep an eye out soon for a recipe post! It's not all cupcakes either, there are also recipes for cookies and whoopie pies! Are we spoilt or what?! If you can't wait to get your hands on a copy of Miss Melicious Cupcakes the book is available at all good book stores now! 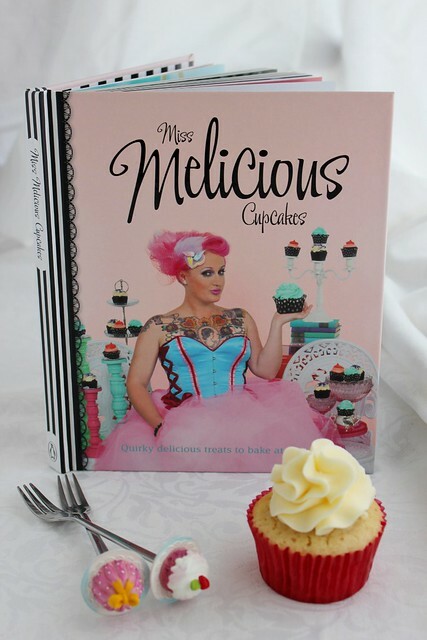 Check out the Miss Melicious Facebook page to find out what flavour cupcakes will be available each day in the shop as well as updates on her book and other exciting Melicious news! Missy has been generous enough to give one lucky Lydia Bakes reader a copy of their very own Miss Melicious Cupcakes book. All you need to do to get in the draw is head on over to the Miss Melicious website or pop into the store and tell me your favourite flavour. Please include your name and email address in the comments below. Congratulations to Kirstie MacGowan. I will be in contact shortly. Good luck! The winner will be picked at random using the randompicker.com generator and notified on Facebook on the 16th of October 2012. Entries only open to New Zealand residents. Oh could not go pass a Cherry Ripe Cupcake, they sound very moreish. It's tough to pick just one flavour! So I'm gonna pick three. :P Creme Brulee, Grapefruit Spritzer and Mint Condition! Definitely a Creme Brulee!! 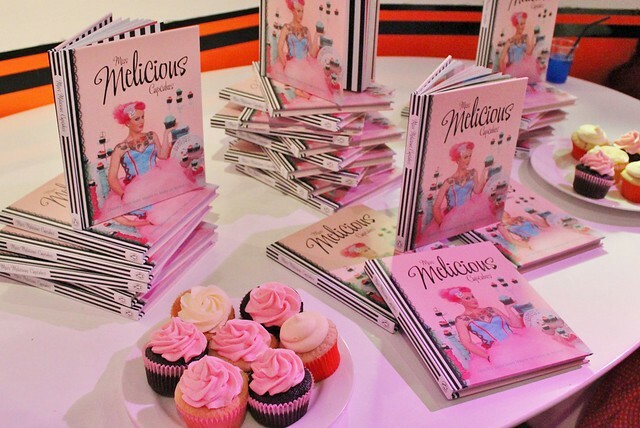 I love Miss Melicious cupcakes and I am dying to get the book! Om nom nom - Pavlova - yum! LOVE the French toast cupcake the sweetness of the cake + butter cream and salty bacon yum ! My favourite is definitely the Raspberry Choc so far, but I have plenty more flavours to try! The Lemon Meringue looks to die for! Om nom nom.. and the Creme Brûlée.. they all look so scrummy! I would love to win a copy. Creme Brulee would be for me. Picked up a few cuppies at the Food Show - there was a peachy one that was just mmmmmm......also sticky date!! I must agree with Miss Melicious (great job on Good Morning too!) and Creme Brulee is amazing - however with all those flavours, I wouldn't want to be too picky..
RAINBOW BRIGHT! yum yum yum! Beet box sounds like an interesting take on red velvet - which is always my fav! Lucky you to go to the book launch! I think the Grace Kelly cupckes sound very glamorous. OMG so many to choose from, Grapefruit spritzer sounds divine though! I would go for the Jelly Tip!! My favourite flavour would be the Vegan Carrot cupcakes. O em gee, Creme Brulee sounds amazing!